For those of you starting to plan out your winter trips for the upcoming season. 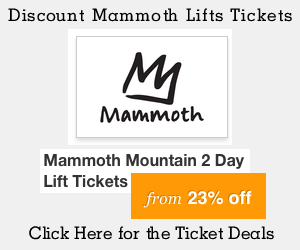 Bookmark this page for Discount Lifts Tickets from the Snowman. We have tickets from just about every ski area in the country. Thanks for the support! Mammoth Mountains Ski Patrol is a tightly knit group that loves to work hard. The number one goal is to save life’s by keeping the mountain as safe as possible. From setting up fencing to avalanche work to helping the injured, the Mammoth Mountain Ski Patrol covers it all. Without their presence on the hill personally I would feel unsafe to be out playing the way we do. We have created a video playlist of the ski patrol videos we found on you tube and the snow study site video Snowman & Alex made a few years back. Check it out today! The Mammoth Mountain Weather Guy has his first El Nino Weather Slide Show Briefing ready for us on this late August day. Enjoy the update and please share and like this post so more Mammoth Mountain lovers will see this information. Thanks and Pray for Snow! The post El Nino Update from the Mammoth Mountain Weather Guy appeared first on MammothSnowman.com. A nice day in Mammoth Lakes and up on Mammoth Mountain. Mostly clear blue skies with just a light smell of smoke in the air at times. Time to get out and enjoy summer before it’s over.